This is a girl for the Suri breeder who wants potent genetics and beautiful phenotype. Pucara Koko Mist is one of the few Pucara PureSuri females available in Canada. You can tell just by looking at her that she holds those desirable Suri traits in abundance. She's a well put together female who will do any Suri breeder proud and make their stud male famous! The genetics tell us you can't go wrong. On her paternal side, you have Madiba. 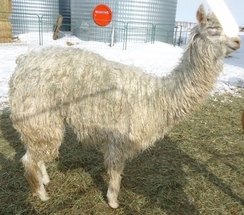 He is sired by one of the most dense Suri males on the planet, Viho, who in turn is a son of the very famous Inca. The dam is the famous Silkworm, who is a daughter of the one and only Bruxo and MacGyver's half sister by Uribe, DDF Gracie. The on the bottom side, as they say, the maternal side of Koko Mist you have the one and only Pucara Kahuna, five times Light Futurity Herdsire of the Year. Koko Mist is gifted with a Suri fleece abundant in high luster, a slippery smooth handle and the density and fineness that Pucara has been able to achieve throughout their herd. Koko Mist shows off that Pucara Suri head, after all Don Julio Bareeda said to them that the head of an alpaca is the window to its quality. She also shows off her correct frame and girth along with a smooth easy gait when she walks up to her friends for a little loving. Koko is offered for sale bred to one of our great Herdsires later this Spring and delivered to your farm.